Despite the drought, most of my plants are growing. I water the plants, if I didn’t, they would die. The ground is deeply dry. It is too dry to cultivate. The only weeds that are growing are some very annoying grass-type-producing bulbs that are all over my garden and morning glories are spouting here and there. I have been pulling the weeds by hand. I’m a real grouch today (it happens), so I thought I would take a few pictures of the garden. I’m not sure what ‘grouch’ has to do with garden except for the Mary, Mary quite Contrary rhyme. Earlier today, I watered the plants. Each plant has a well to hold the water and rows have a ditch to hold water. It’s the only way to insure that the plant gets the water and not the surrounding plant-less area; I certainly do not want to water paths and encourage weeds to grow. I am happy with the tomatoes. Yesterday, I picked the first cherry tomato and another plant has one that is ripening. 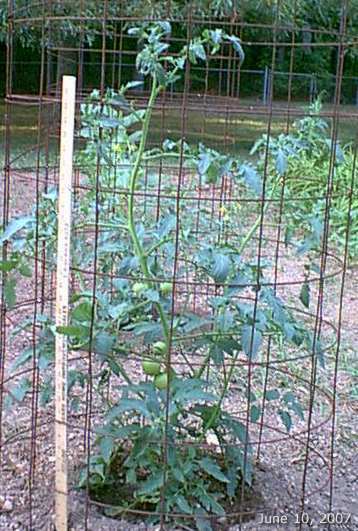 The big tomatoes have grown 22 inches since May 24th – how many days is that – 17 days. 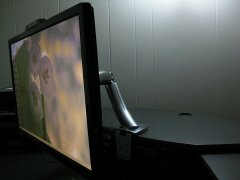 That is good. In this area, they typically grow up to 15+ feet during the summer. They usually grow out of the 5-foot cages, grow down to the ground (another 5 feet) and if I weave them back in and they will grow out of the cages again. They are vines, after all. One of the regular tomatoes with a yard-stick. I actually carried a yard stick outside to take this picture. This is mint. 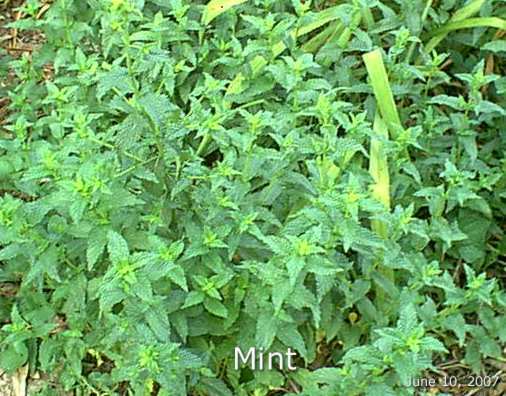 Did you know that plants in the mint family have square stems? I will dry the mint for mint tea. 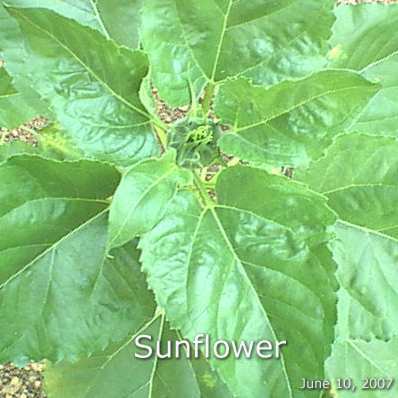 This is one of the sunflowers in my garden. I have dozens of them, somewhere between 80 and 100. 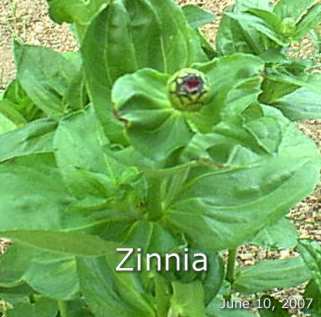 A zinnia flower bud. 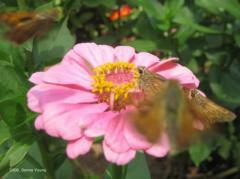 I love zinnias. I plant them from seed and some years none germinates. This year they all did. I have red ones and pink ones. Goldfinches love the ripening seed heads. 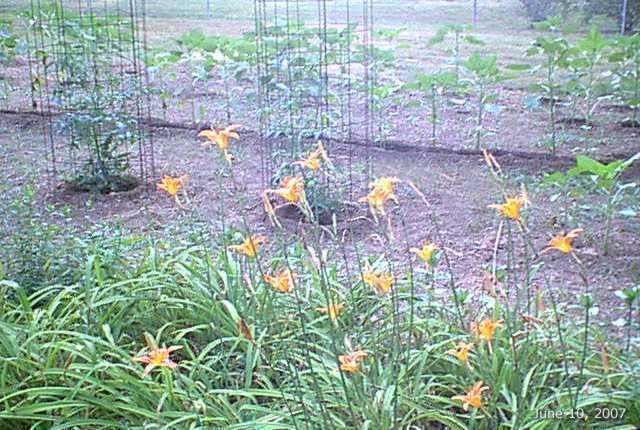 This is a shot of the garden showing daylilies in the foreground. I planted them here many many years ago. That is all for the garden subject. Oh, and I love your garden pictures. A house down the road has some blooming sunflowers and I’ve already decided I will plant some of these next year, but not 80-100! I planted an entire package of spearmint seeds, and can you believe that only one germinated? And it’s still so tiny and miserable looking I can hardly stand it. I plan to buy some mint plants every time we go out, but then I start feeling contrary and change my mind. My mint had better shape up soon. I like that rhyme (I’m glad that Melanie had that typed out already because that is one of those words that always gives me fits 😐 ) it fits me sometimes as well. I just did some planting, not what I had dreamed of doing a couple of months ago but I couldn’t get my family behind me on doing it – w/o their help the plants would probably die so why bother.